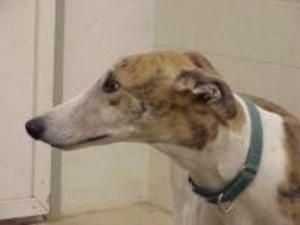 Durango was found wandering loose and was brought to the Birmingham Race Track's adoption kennel. It took them awhile to figure out who he was and where he came from because his identifying ear tattoos were badly faded. He was identified eventually as EZ Durango. He had raced 25 races starting at Seabrook then moving to Birmingham AL. He retired from there and was adopted in 2004. His mom had been deployed and had left him with relatives. He had run away from the relatives house and had been missing for a year and a half. Another family found him, took him in and kept him until his most recent escape. His original owner was contacted and is still deployed in another country. Her relatives are unwilling to take him back. Durango just turned 13 on Nov 5th. His sire is Oneco Wiseman and his dam is Good Storm. He raced at 68lbs but is on the thin side now so is a smaller guy. Durango came in with a small tumor that needed to be removed and was under weight but other than that the vet said he was remarkably healthy for a guy his age. He loves children and passed his cat and small dog tests there. The really good news is that he has a wonderful home to go to already as soon as he arrived on Nov 14th.